Coins that have been reviewed and stickered by Certified Acceptance Corporation (CAC) consistently bring premiums over other “non-stickered” coins in the marketplace. Below are some examples from recent actions sales on April 2018 one may use for a refference. GreatCollections sold a CAC-approved MS-67 1902 quarter for $18,562.62, on April 8. The only recent auction record for another certified MS-67 1902 quarter is the sale of the Gene Gardner coin, without a CAC sticker, in May 2015 for $7,637.50. Also on April 8, GreatCollections sold a CAC-approved MS-65 1912 $20 gold coin for $39,150. On April 24, Heritage auctioned a certified MS-65 1912, without a CAC sticker, for less than half as much, $18,000. Earlier, in January 2017, Heritage auctioned another certified MS-65 1912, without a sticker, for $21,150. At the Central States Convention in Illinois, on April 25, Heritage auctioned a CAC-approved MS-65 1837, No Stars, Small Date half dime for $3,000. In January 2018, at the FUN Convention in Tampa, Heritage auctioned a certified MS-65 1837 half dime of this same variety, without a CAC sticker, for $1,800. A year earlier at the FUN Convention in January 2017, another certified MS-65 half dime of this variety, without a CAC sticker, brought $2,585. In the Heritage auction at the Central States Convention, a CAC-approved MS-66 1854 half dollar realized $31,200 on April 26, 2018. On August 11, 2016, a different major auction firm sold a certified MS-66 1854 half dollar, without a CAC sticker, for $13,512.50. On August 13, 2011, another certified, but not CAC approved, MS-66 1854 half dollar brought $17,825 at auction. At the Central States Convention, also on April 26, Heritage auctioned a CAC-approved MS-63 1901 silver dollar for $16,800. On March 11, 2018, GreatCollections sold a certified MS-63 1901, without a CAC sticker, for $12,947.25. Early in 2017, two different auction firms each sold a non-CAC, certified MS-63 1901 for $10,575. Another CAC-approved MS-63 1901 was auctioned for $24,675, back in November 2016. On April 26, within a span of seconds, Heritage auctioned two PCGS-graded MS-67 1924 Peace Dollars. 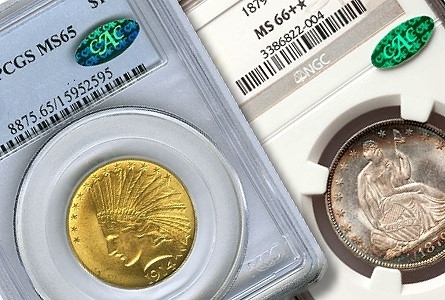 The one with a CAC sticker brought $9,600 and the coin without a sticker realized $6,900! On April 26, Heritage auctioned a CAC-approved MS-65 1915 $20 gold coin for $33,600. This is not a fluke, as the exact same coin was auctioned in January 2010 for $25,300. In January 2018, Heritage auctioned a certified MS-65 1915 twenty, without a CAC sticker, for $12,600. In the near past, Heritage has auctioned several PCGS graded MS-65, non-CAC, 1915 $20 gold coins: for $14,100 in January 2017, for $16,450 in November 2016 and in August 2016, for $17,625 in August 2016 and in February 2016. So, the CAC coin brought from 43.5% to 167% more than the non-CAC coins. Also on April 26 at the CSNS event, Heritage auctioned a CAC-approved MS-63 1854 silver dollar for $21,600. In January 2017, Heritage auctioned a non-CAC, certified MS-63 1854 silver dollar for $14,687.50. The CAC coin brought 47% more. On April 29, GreatCollections sold a CAC-approved, NGC-graded MS-67 1936-D quarter for $3,326.62. In the Long Beach sale during February 2018, Heritage sold a PCGS graded MS-67 1936-D, without a CAC sticker, for $2,600, 27.9% less than the CAC MS-67 1936-D.
On April 29, GreatCollections sold a CAC-approved, NGC-graded MS-67 1959-D quarter for $1,800. In the Long Beach sale during February 2018, Heritage sold a PCGS-graded MS-67 1959-D, without a CAC sticker, for $780, much less than half as much. Back in August 2016, at an ANA Convention, Heritage auctioned a different PCGS-graded MS-67 1959-D, without a CAC sticker, for $881.25, also less than half as much as the CAC 1959-D that just sold for $1,800.